Established in 1915, the Alaska Agricultural College and School of Mines opened for classes in 1922. The Alaska Legislature officially changed the name to the University of Alaska in 1935 and to the University of Alaska Fairbanks in 1975. The campus conducts more than 90 percent of UA system research. It is known worldwide for arctic biology, arctic engineering, geophysics, supercomputing, and native studies. Research activities are organized into several institutes and centers such as the Geophysical Institute, which operates the Poker Flat Research Range, a collegiate rocket test range. Others include its Agricultural and Forestry Experiment Station, Institute of Arctic Biology, Institute of Northern Engineering, and the International Arctic Research Center concentrating on climate change. Its Arctic Region Supercomputing Center is its high-performance computing arm while the School of Fisheries and Ocean Sciences has research facilities and projects all over Alaska and the Arctic Ocean. Besides UAF, the system’s other universities are the University of Alaska Anchorage and the University of Alaska Southeast in Juneau. With their satellite campuses, the three have a total of 19 locations. UAF has nine academic schools and colleges offering 190 different degree and certificate programs in more than 120 disciplines. One research facility that visitors can explore is the Robert G. White Large Animal Research Station. It has received acclaim for its research and education in high-latitude biology and for providing facilities and expertise for colonies of large animals - caribou, reindeer, and muskoxen. The site comprises 134 acres of the former Yankovich homestead which was deeded to the university in 1963. In 1964, John Teal began a domesticated project to study muskoxen which had disappeared from Alaska in the 1890's. He brought to the property a herd of 33 animals captured from Nunivak Island. In 1974, this original herd moved first to Unalakleet and later to Palmer. There the Musk Ox Farm was established under the direction of the Musk Ox Development Corporation. 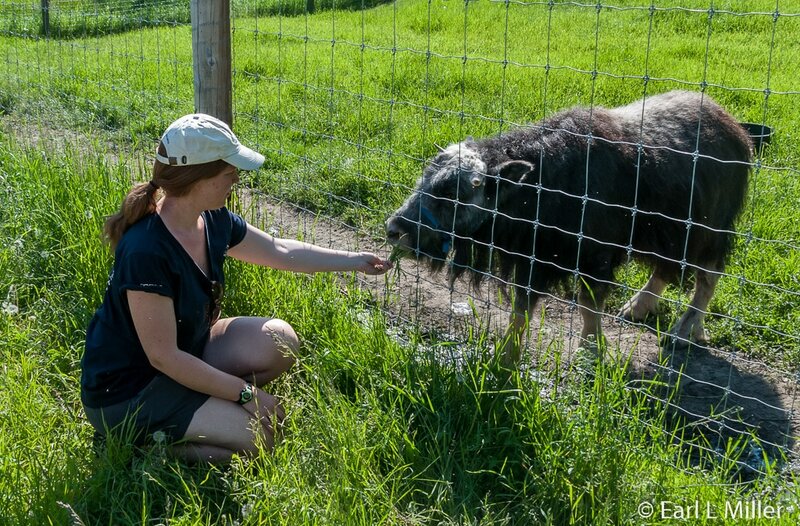 The Large Animal Research Station, through a major grant from the National Science Foundation’s Office of Polar Programs, was founded in 1979 with the intent to establish a muskox’s colony for research purposes. The plan was to study their nutrition, physiology, genetics, disease, and behavior while providing a place near the university for captive ungulates. Within three years, reindeer, moose, and caribou colonies were established at this station. Later the moose transferred to the Alaska Department of Fish and Game Moose Research Center in Soldotna, Alaska. The Station has a centralized handling facility, equipment for large animal restraint, a lab, a classroom, feeding and bedding storage units, offices, and living quarters. It is inspected for approval for animal research by federal and state authorities. 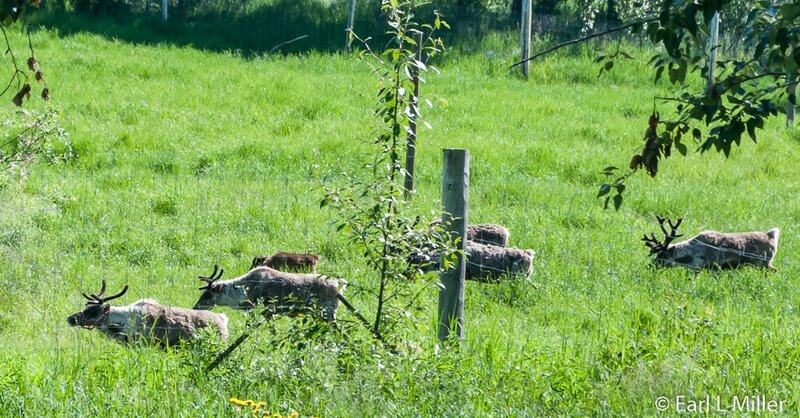 Half of the land is maintained as pasture with the remainder as boreal forest, providing a mixed habitat for the animals. 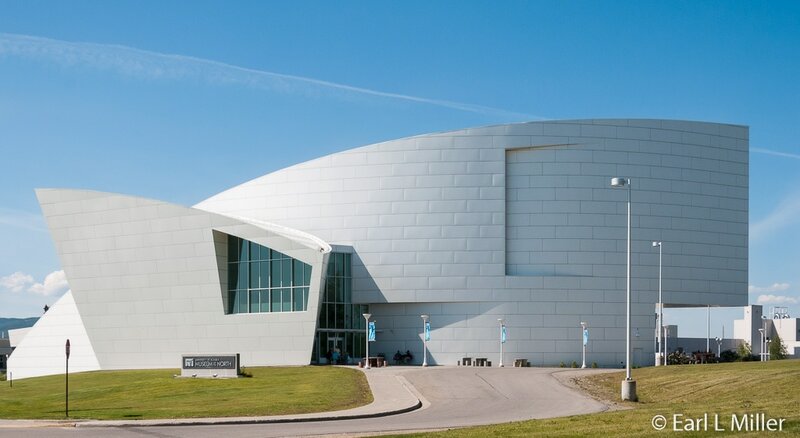 It also serves as an educational facility for the thousands who visit each year. You can attempt to spot the animals for free from the parking lot. 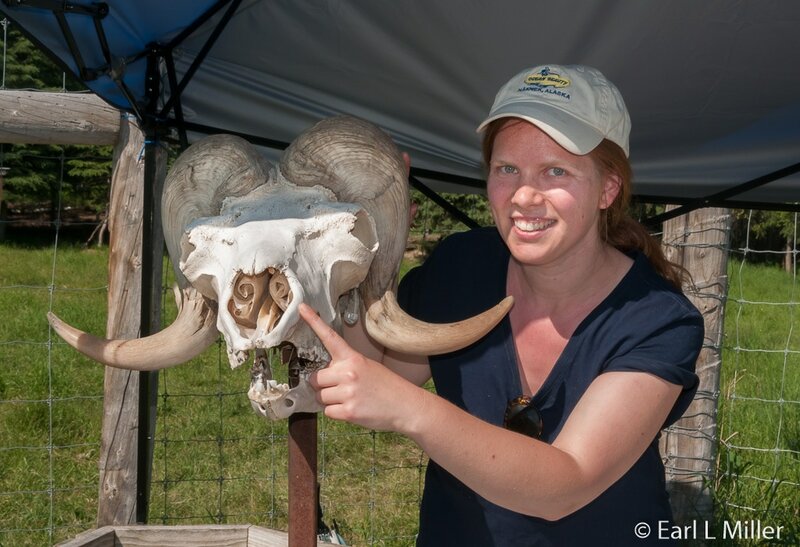 Another option is to pay for a tour at 10:00 a.m., noon, and 2:00 p.m. Wednesday through Sunday, from early June through early September, when naturalists answer questions about the animals and the Station. Reservations are not required for these 45-minute presentations. Tours are $10 for adults, $9 for military and seniors (ages 65 plus), $6 for students, and free for ages five and under. The tour begins at the shop to meet a guide. Following a short trail to the kiosk, we saw muskoxen and caribou who were up close and a herd of reindeer from a distance. Our guide strung willow branches through the fence in an attempt to attract the animals. Golf cart rides are provided for those requiring transportation. Picnic tables and port-a-potties are at the site and available to the public. We discovered photography is impaired because of the triple fences. The presentation includes talks about all the animals as the guide explains and passes around the caribou and muskoxen skulls and the foot, velvet, and a rack from a caribou. While we watched the presentation, three reindeer and some muskoxen approached the fence. She pointed out that antler racks can weigh up to 40 or 50 pounds and have a five-foot span. They are used in defense and mating. Those animals with the largest racks have their choice of cows. Our guide advised reindeer and caribou are the same species but a different subspecies. Some differences exist in personality and body types between the two animals. Reindeer have a barrel body and stout build as contrasted with a caribou’s long and lean limbs. Differences in temperament can exist, too. 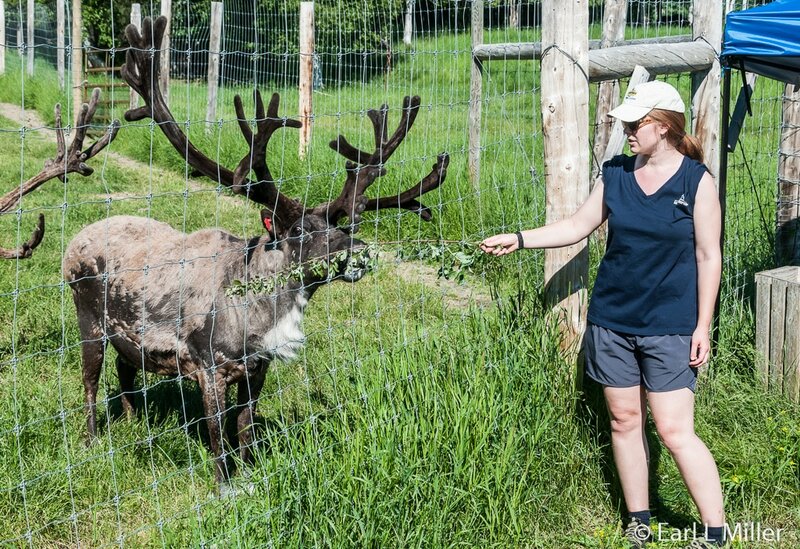 Reindeer tend to be more docile as compared to caribou which are more skittish around humans. Perhaps, this is because reindeer are considered the domesticated version of caribou. 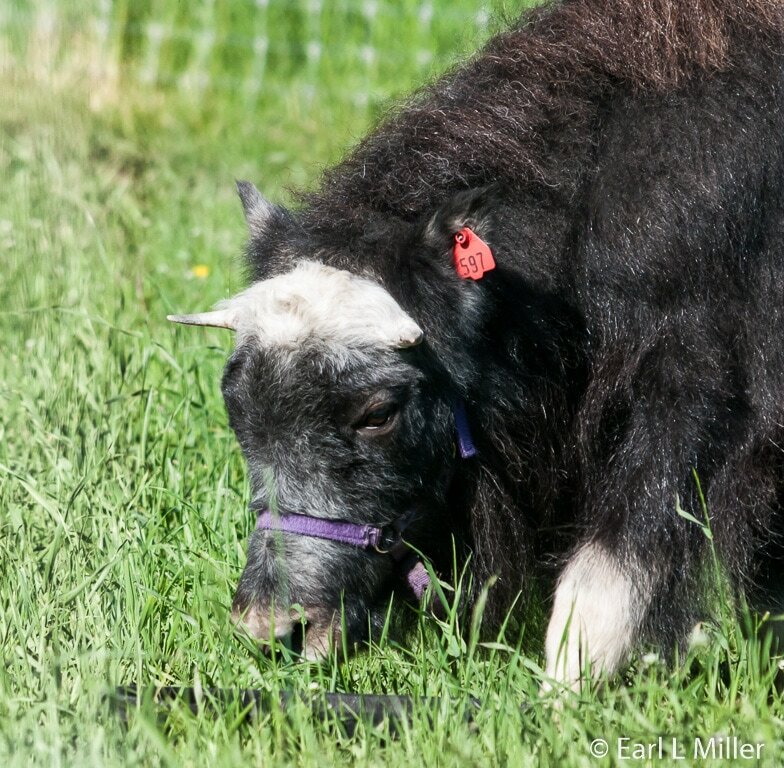 Muskoxen are born and bred on the property. For handling and training purposes, staff pulls them from their mothers when they are around four weeks ago to bottle raise them. They even encourage the calves to enjoy a kiddy pool. The babies weigh 20 pounds at birth while at six weeks they have grown to 60 pounds. When full grown, females weigh 600 pounds with males 800 pounds. Cows typically give birth to one calf at a time, but LARS is home to the oldest known set of muskox twins, Romulus and Remus. Muskoxen are the only large mammals to live in the Arctic year round without migrating or hibernating. For insulation, they grow a thick layer of fur called qiviut underneath their guard hair. During the presentation, some of this fiber is passed around so visitors can feel its softness. Qiviut is harvested at LARS each spring and sold to be spun into yarn for knitting. Each animal produces around six pounds a year. At $35 an ounce when not dehaired, it’s expensive. The proceeds raised from this operation are returned to the farm for facility maintenance and animal care costs. The farm’s Antler and Horn shop displays work by Alaskan artists and sells children’s books, LARS apparel, Alaskan souvenirs, and qiviut. All proceeds from admission and the gift shop return to the farm. Research is still ongoing. The nutrition study on qiviut is to see how it affects growth. A study with reindeer bulls is ongoing looking at the effect of depo-Provera, a form of birth control, on rutting behavior. To learn more about these animals, go to our November 19, 2016 article on Palmer’s muskoxen and reindeer farms. Its link is Reindeer to Muskox. 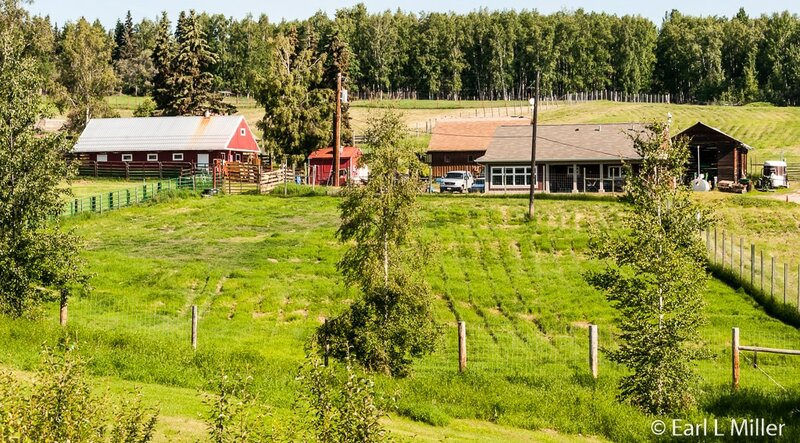 The farm’s address is 2220 Yankovich Road, close to the University of Alaska Fairbanks campus. Their telephone number is (907) 474-5724. Hours are 9:30 a.m. to 4:30 p.m.
On campus, the UA Museum of the North, a two-story museum, is regarded as one of Fairbank’s prime attractions. It tells fascinating stories about Alaska’s people, events, and wildlife. Artwork from 2,000 years ago to current day is also a major part of this facility. Its new wing, which opened in 2005, is an architectural icon for the state. Located on the first floor, visitors find the auditorium for videos and presentations, special exhibits, store, and café. The largest exhibition space is devoted to the Gallery of Alaska dividing the state into five areas. These consist of southwest, western and Arctic Coast, the interior, south central, and southeast Alaska regions. All have artifacts associated with the Native Alaskans, animals, geography, and history of each region. It’s a combination providing a thorough insight and understanding of the state. To enhance your enjoyment, you can download a video app that provides in 76 segments additional information to what you are viewing. The link to a direct download is available on line at the Museum's web site. 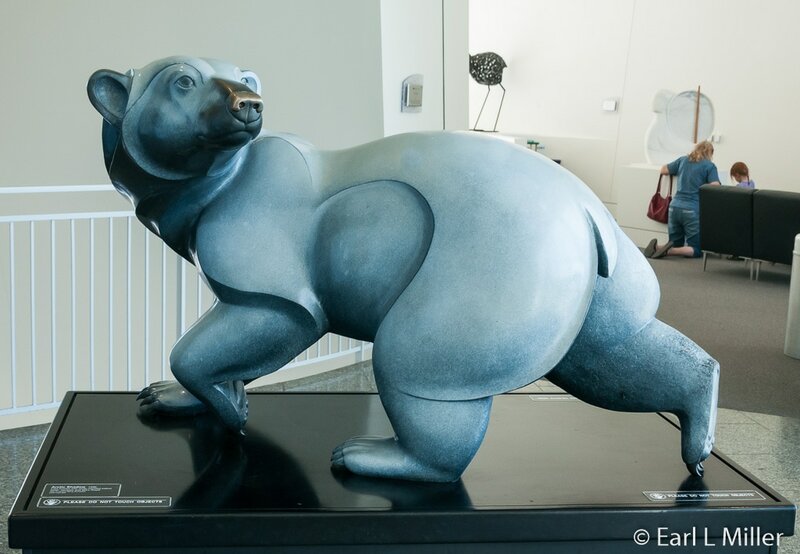 At the entrance gallery, Otto the Bear greets visitors. He was a huge brown bear that stood 8-1/2 feet tall and weighed 1250 pounds. According to the museum’s website, Otto was killed by Arthur Johnson near the Bering Sea in 1950 and put on display the next year. 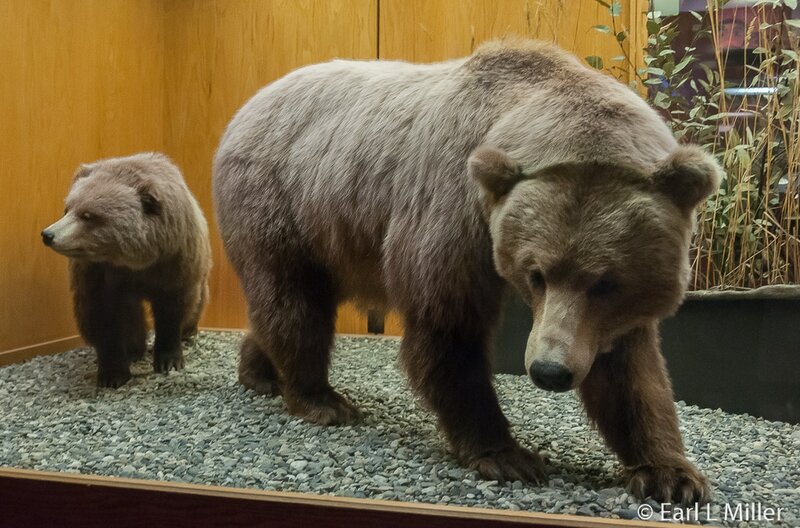 Now this Boone and Crockett trophy bear is the most photographed item in the museum. Visitors then enter the Southwest section which includes the Alaska Peninsula, Kodiak Island, Pribilof Islands, and the Aleutian Islands. The Native Alaskan emphasis here is on the Aleuts and Alutiqs. One collection displays magnificent basketry which flourished among the Aleuts until about 1919. 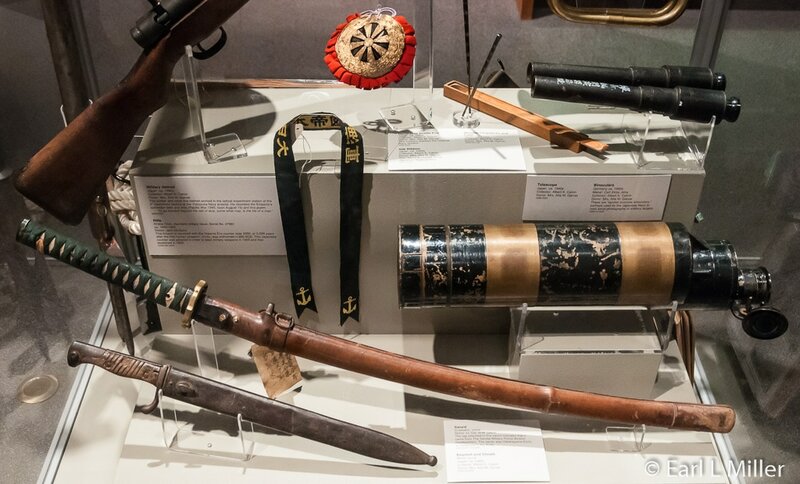 Others include Eskimo dolls, boots, a kayak with figures, and a case full of Japanese memorabilia such as a helmet, rifle, and swords from when they occupied the Aleutians. 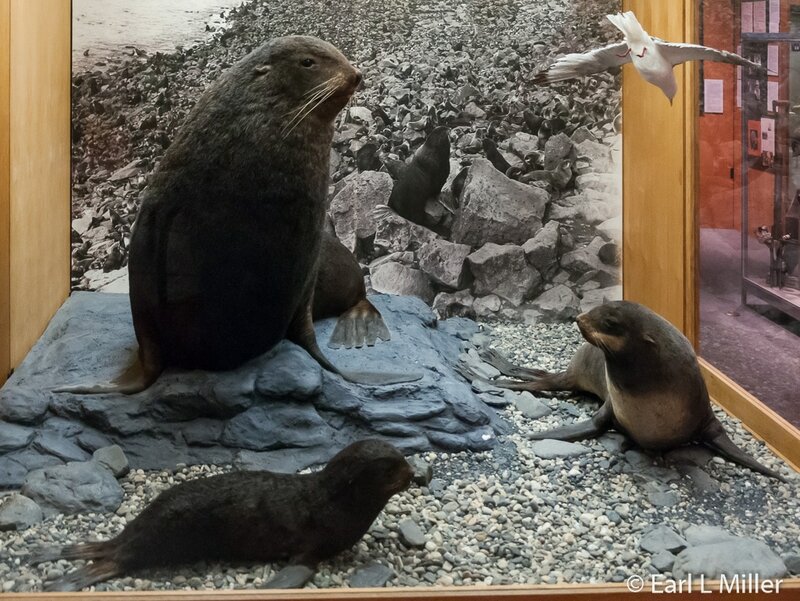 Natural history fans find specimens of seabirds from the Aleutians and Pribilof Islands, an otter, and a northern fur seal family. 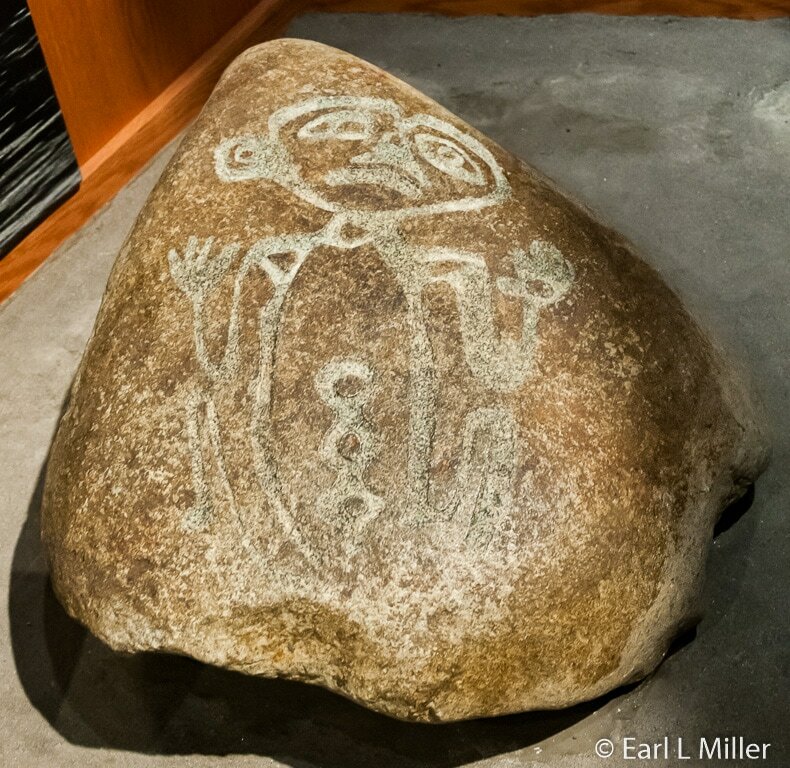 One fascinating discovery at the museum is the Seal Stone, a large grey boulder covered with intricate petroglyphs, images of human figures and eyes, and geometric designs. The animal profile edged at the end of the rock provided the name. Despite studies, mysteries still surround the stone’s origin and significance. In a century of archeological work and surveys on the Aleutian Islands, only one other petroglyph has been found. Another attention grabber is the photo exhibition and folio, “Forced to Leave” relating the World War II evacuation of Alaska’s Japanese Americans and Aleuts from the Pribilof and the Aleutian Islands into internment camps in southeast Alaska. Families were placed in 8 foot by 8 foot cubicles with horrible living conditions. One in ten died. Ths display has a video on this subject. The coastal plain is the most prominent feature of the next section titled the Western and Arctic Coast. 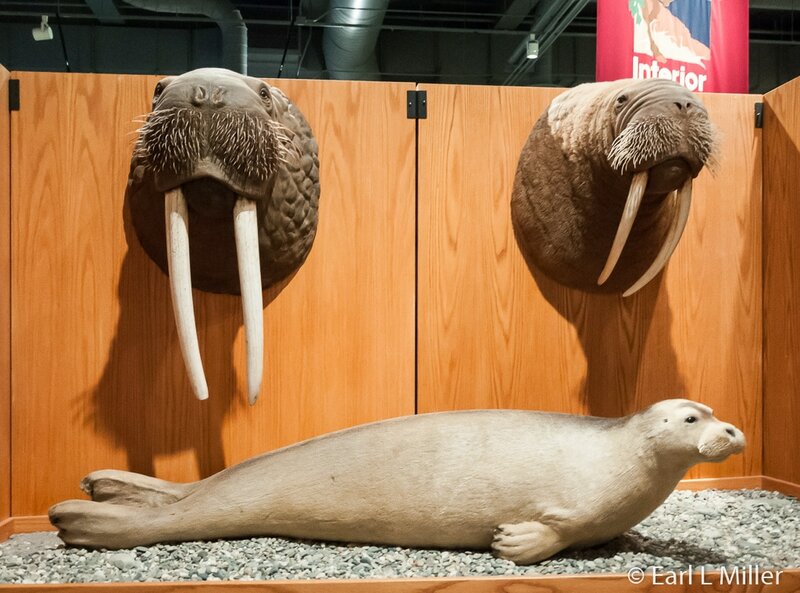 One highlight displays nine species of marine mammals including the polar bear; ribbon, ringed, bearded, and spotted seals; and a walrus. Other displays are the massive humpback whale skeleton and skull and a muskox and wolf. You’ll learn about the Boulder Patch, the Arctic’s underwater garden. In a one-third scale diorama, you can spot diverse animals and discover why the growing season for the area’s plants occurs most commonly in winter. The Dinosaurs of Alaska exhibit concentrates on the Museum’s pioneering techniques once used to collect plants and animals on the North Slope, approximately 65 million years ago. The Museum is touted as having the largest collection of high-altitude dinosaurs and related animals in the world including many reptilian and early mammal species. The Inupiaq and Yupik Eskimos are featured in this section. Look for the ivory carvings dating since 500 B.C. You’ll also find cases of masks and art, basketry, Native American traditional garments, and the tools these cultures used. 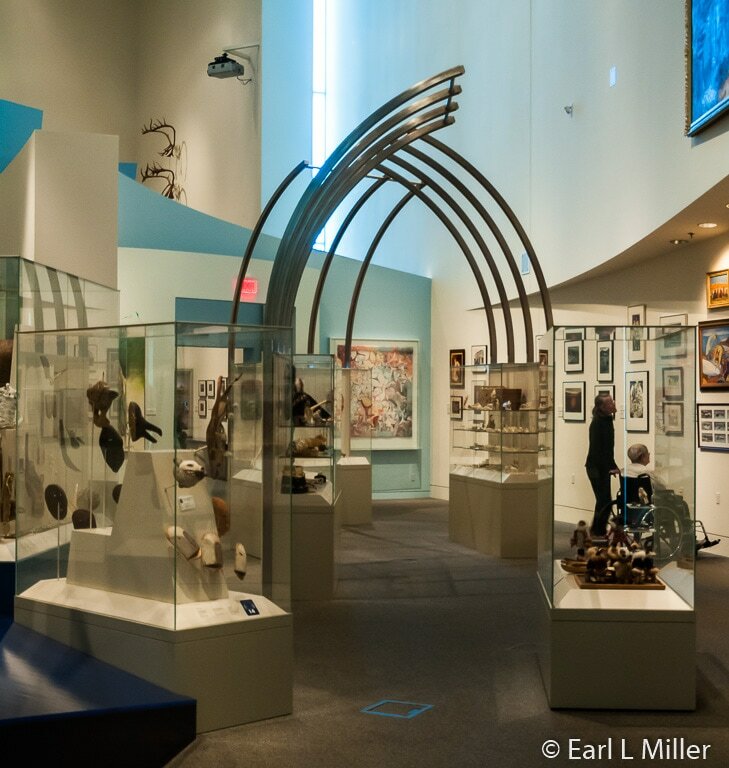 Take time to enjoy the various video clips produced by the Alaska Native Heritage Film Center on such exhibit themes as whale hunting, dancing, and storytelling. 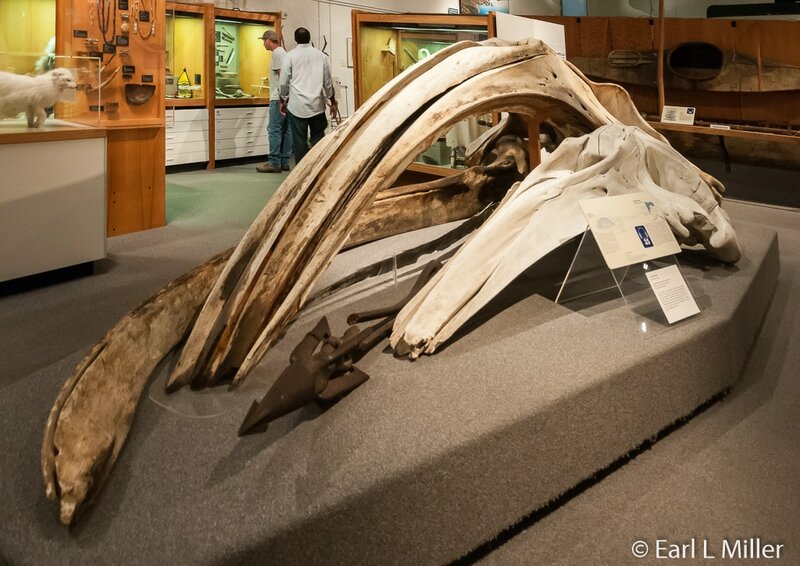 Other highlights are the caribou skeleton and a large, open, whaling boat called the umiak. A large woolly mammoth skull and tusks are at the entrance to this section. It’s a testament to the 31 species of Pleistocene mammals that once roamed the area. Athabascans are the highlighted interior culture. Look around to see examples of a freight sled, fish wheel, and cabin. Note the two dolls in Athabascan dress. One case contains Athabascan wood masks. Another holds such pelts as a woodchuck, marmot, and porcupine since using furs was vital to these people. Learn about Fairbank’s history from 1900 through the 1980's, particularly its founding as a gold mining town. The gold case in this section should not be missed. It displays small to fist-size nuggets recovered from streams and gold that has been worked into artifacts. The exhibit is touted as the largest display of gold nuggets in the area. You’ll meet some of the interior’s pioneers. One was Belinda Mulrooney who built several hotels. Another is Fannie Quigley, a female miner who came from Kantishna in the Denali area. Near the information on her is the model of Denali which lights up to reveal climbing routes. Another historic feat was the building of the Alaska Highway during World War II. The exhibit in this area illustrates how the 97th Army Corps of Engineers, an all-Black regiment, built the Richardson Highway, Tok Cutoff, and the Alcan Highway. Natural history fans, will want to view “Butterflies Across the Tundra” and the specimens of a lynx and brown bear with its cub. Since the Aurora Borealis can be viewed near Fairbanks, take time to view a video on the science, history, and beauty of the northern lights. It will add to your appreciation of the subject. Another exhibit covers the Pleistocene Age with skulls from the American lion, wolf, bison, and Northern horse. See actual mastodon bones. 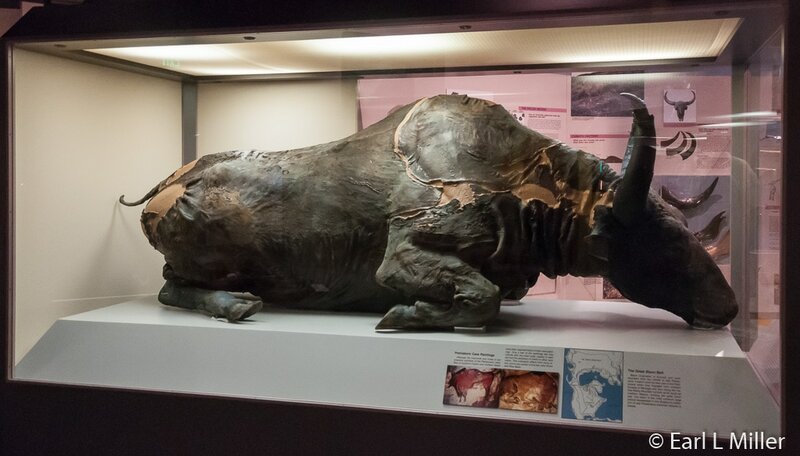 A highlight is the giant Blue Babe, an Alaska steppe bison killed 36,000 years ago by an American Ice Age lion. It appears to have died during the fall or winter when the weather was cold. This allowed the carcass to cool rapidly and soon freeze so it wasn’t susceptible to scavengers to eat. Blue Babe was encased in permafrost and uncovered during a mining operation in 1979 near Fairbanks. The bison became exposed as water from a hydraulic mining hose melted the frozen muck which had embedded it. Paleontologist Dale Guthrie decided to excavate it immediately when he determined its age, freed it, and brought it to UAF. The carcass was covered with a blue chalky substance when it was excavated. This was caused by a mineral coating of white vivianite produced when the animal’s tissue phosphorus reacted with the iron in the soil surrounding the animal. When the vivianite was exposed to air, it turned blue earning the bison the nickname Blue Babe. The only two other discoveries in permafrost have been a juvenile woolly mammoth and an adult woolly mammoth. 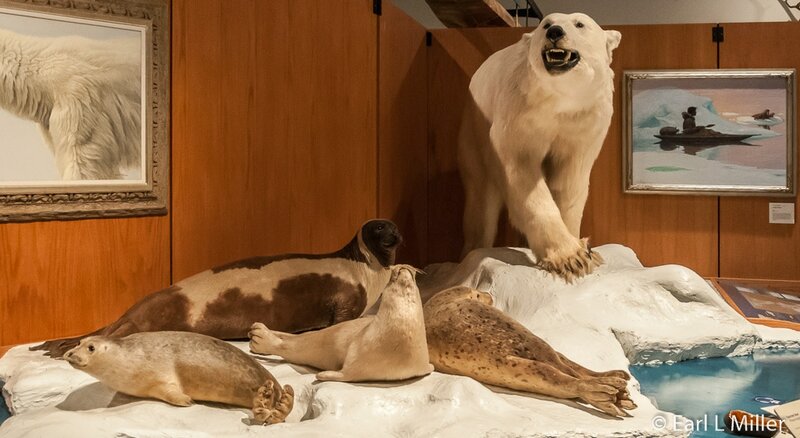 They have been reconstructed and put on display in Leningrad’s Zoological Museum. The Birds of the Wetlands exhibit in this section emphasizes the Copper River Delta, an important resting and feeding area for millions of migratory shorebirds and waterfowl. A map illustrates their migration routes. Some birds depicted are Eiders, geese, swans, and jaegers. Russia was an important influence on this area so artifacts from that country are on display. 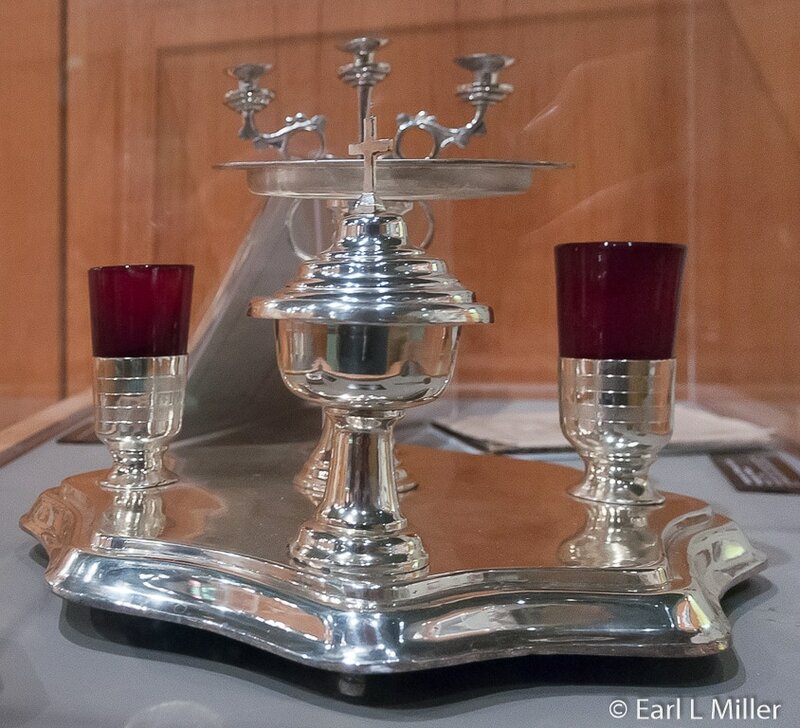 The church was vital so you can see a sacrament container, Litya plate, and incense spoon. You’ll also view a case of items used in their daily lives such as a padlock, curling iron, and giant teapot. The Russians affected the Native Alaskan Eyak and Alutiq cultures whose gemstones and baskets are in one case. The Alaska Pipeline runs from Prudhoe Bay south to Valdez. The museum has made a one-third scale size of the pipeline’s above ground support as well as provided information on sections above and below the ground and on construction data. Natural history is not forgotten. Check out the beaver and muskrat specimens. 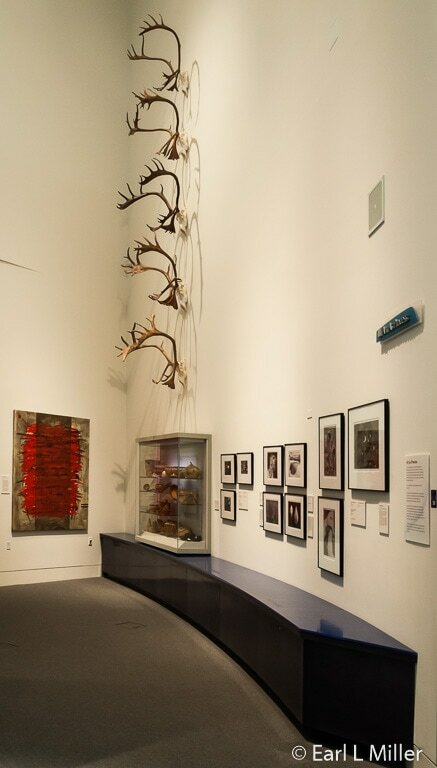 Circling around the Gallery, you’ll advance to this section dedicated to the Tlingit, Haida, and Tsimshian cultures. 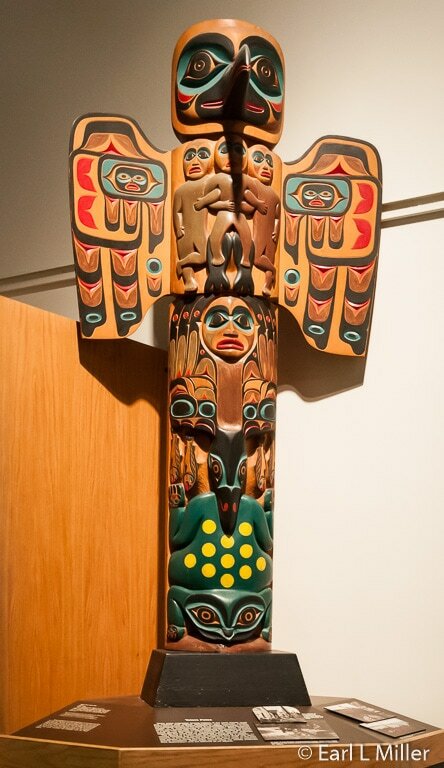 One highlight is the raven flood totem pole made in Sitka in 1946 by students from Mt. Edgecumbe school. It’s a replica of the original one erected in Ketchikan during the late 1800's. Find out about Native Alaskan potlatches. See Tsimshian baskets and Tlingit masks, jewelry, and clothing. The clothing on display features trade beads or buttons sewn on in various clan designs such as ravens or whales. Another display includes plate tectonic maps reconstructing Alaska’s geologic history. A case holds a variety of minerals from this section of the state. Cultural history is explored through exhibits on Juneau and the Klondike Gold Rush. Salmon fishing is one of Alaska’s main industries. The large king salmon models take visitors through from the fertilized egg to the spawning adult of all Alaskan salmon species. A bear, Dall sheep, and Golden eagle are also on view. Alaska Classics is a collection of artworks showing an array of landscapes, portraits, and village scenes. Most of these are by Sydney Laurence, Eustace Ziegler, and Ted Lambert. However, other 19th and 20th century Alaskan artists are also represented. Much of this work is on permanent display though temporary shows do occur. In the area Natural Wonders, Michio Hoshino, a Japanese-born nature photographer, portrays, via eight photographs, Alaska’s landscape and intimate wildlife moments. In 1990, he won Japan’s highest award for photography. He continued his work until killed by a brown bear while on assignment in eastern Russia in 1996. This downstairs gallery features short-term exhibits on a variety of subjects that have been built by the museum. Continued from 2016, the show “Expedition Alaska: Dinosaurs” is a major attraction. Visitors see teeth, skeletons, fossils, and tracks of extinct reptiles and their contemporaries and can observe a virtual field camp. The museum vaults contain about 6,000 dinosaur bones and bone fragments found throughout Alaska. Earth sciences curator Patrick Druckenmiller calls it, “The largest collection of polar dinosaurs in the world.” It’s the only research lab in the state studying dinosaurs. This gallery provides rotating exhibits. The current show is about the museum’s archeology and mammal collections. It covers such topics as what artifacts and specimens can tell us, why museums collect objects, and where scientists have gone to search for them. It also explains who is working to document Alaska’s ancient history and living mammals. Videos, filmed on location, show scientists seeking clues. The Place Where You Go to Listen is an unusual sound and light environment created by composer John Luther Adams. You watch a wall’s colored panels change according to such real time rhythms as daylight and darkness, the moon’s phases, the seismic vibrations of the earth, and the dance of the aurora borealis. For example, an earthquake is portrayed in resonant sounds. We found it hard to understand. At the family room, the museum offers puzzles, games, books, and hands-on activities from previous special exhibits for children and families who can relax on comfortable couches. At this huge gallery, artwork varies from 2,000 year old ivory carvings to paintings dating from the 1990's. Strengths include historic and contemporary landscape paintings; the largest collection of Alaskan photography, including ones by Ansel Adams; contemporary Native Alaskan art; and traditional and contemporary prints and paintings. Gracing the second floor near the stairway is an amazing bear bronze cast with a white marbled patina. This 1996 piece is titled “Arctic Shadow” and was sculpted by Jacques and Mary Regat. Topics are in nine areas. In Ancient Visions, one finds the oldest artworks including ivory figurines, scrimshaw, masks, and decorated tools. 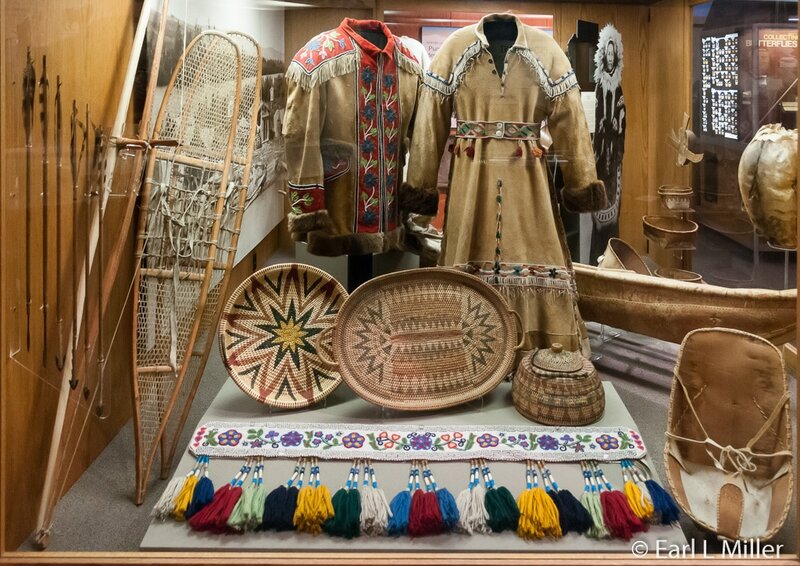 Native Arts, Native Worlds includes clothing and tools used by Native Alaskans in addition to masks and regalia used for secular and spiritual purposes. The Native Art Marketplace consists of baskets, ivory carvings, beadwork, dolls, and purses that Alaska natives offer for sale. Through Visitor’s Eyes is the work of artists traveling through Alaska who document the state and the people working there. Our Land, Our World, Our Art consists of historic and contemporary works by resident artists whose interpretation is based on living in Alaska. You’ll see such items as bowls and scrapers, boots, or a man’s decorated shirt. Highlights consist of artwork from the museum’s collections. These include anything from ivory carvings to views of Denali or a hand-stitched fur parka. All have to show especially fine craftsmanship. Sense of Place features how art can express a sense of place. Themes cover such topics as the boreal forest, the cold, or residing in interior Alaska. Art as Process presents the artist’s perspective through videos of transforming raw materials into artwork. At Our Own Perspectives, visitors write their opinions on individual artwork in a comment book. When you are finished inside, walk around the grounds to see the outdoor exhibits. You’ll find totem poles, a Trans-Alaska pipeline cleaning pig, and an 1841 Russian-American blockhouse. University of Alaska Museum of the North is located at 907 Yukon Drive in Fairbanks. Their telephone number is (907) 474-7505. Summer hours from June 1 to August 31 are 9:00 a.m. to 7:00 p.m. daily while during the rest of the year, it’s Monday through Saturday 9:00 a.m. to 5:00 p.m. Closed Sundays. Admission for 2016 was $12 general admission, $7 for youth admission ages 5-14, and free under age 5. Visitor parking is available adjacent to the museum for $.75 an hour or $3.00 for the day. A parking permit must be purchased from the kiosk in the parking lot. The kiosk accepts cash, coins, or credit cards.